Should Grown Women Wear Jumpers? Since I am a woman of a certain age ~ I definitely declare this look wearable! Now what about you will you make a jumper for the fall season? Or do you think it is just not for a woman over a certain age???? My answer is, "Hell, yes!" In fact, I never stopped wearing them. Above are two of my favorites that survived my recent closet purges. The left one is Italian wool gabardine lined in Bemberg, the right one is heavy wool crepe; I bought the fabric for both at Denver Fabrics. 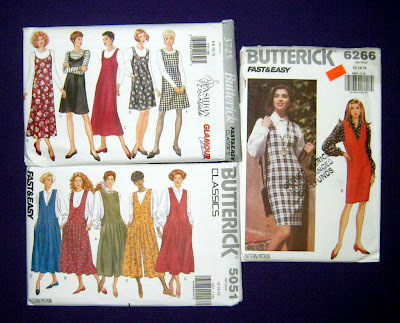 The red jumper, Butterick 6266, has waist darts only. Consequently, there is a little bit of excess fabric at the armholes. A true princess seam that ends in the armscythe would be more effective. Nevertheless, I love the color and wear it whenever it gets cold enough in LA, which is non often enough. The gray jumper, Butterick 3725, has very flattering upwardly sloping bust darts. I recently purged a batik cotton madras jumper made from the third pattern, Butterick 5051. I wore that jumper very often in my twenties, but I doubt I would wear it now. I do love Indian madras plaids that have been waxed and overdyed. I only wish I had bought more when it was available. I haven't seen any lately. These are a few of the jumper patterns in my stash that I haven't made up yet. 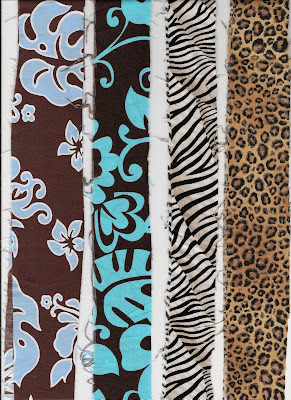 I like the bottom center one the best and might make it up out of rayon/linen twill for the fall. The mommy and me dresses have yet to materialize. 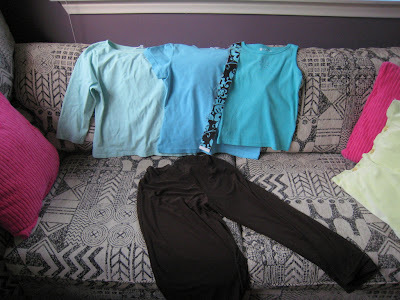 However, I quite like the brown and aqua/turquoise color combination. Once I hemmed the brown pants, I started pairing it with watery blue t-shirts from my wardrobe. Iris wanted me to attach a skirt to the sparkly tank top she recently got. I think the swatch will do. We can imperfectly match! I am embracing imperfection lately. This counts as a wardrobe refashion post. Moreover, the green pillow on the right is a recycled bath towel. A friend of my mother in law moved from San Diego to Florida and couldn't bear to throw anything away, but couldn't take it all with her. My MIL came home with a stack of perfectly usable linens. She had no use for them, but I did. The green towel is so soft, one rarely finds cotton of this quality in bath towels any more. I added some sparkly vintage yellow/silver buttons. I made the pink pillows from new towels from IKEA, but they feel like cardboard. Sometimes, cheap is just cheap and not worth the effort. I am so relieved to be done with the Harry Potter series. I don't have to hurry up and read it before I encounter a spoiler. I can now freely read the comments of others and agree or disagree with them. Mark and I can discuss the story. (He finished it by noon on the Sunday after it came out.) The series is a good yarn, but I am not sure I would recommend that people rush out and read it. It is a phenomenon, but is it a classic? Time will tell. Anyway, millions of people bought and read the book over the last week. Presuming that some of them are habitual readers, then a whole bunch of other books were not being read. That is, the HP phenomenon is a category killer, sucking market share from many other worthy books. In this age of marketing phenoms, how are people to find these worthy books? Not from the booksellers who have become suspect ever since they admitted to taking incentives bribes from publishers for pushing their books. Not from newspapers that are shrinking their coverage of books. No, readers will likely hear about books off the beaten path from other readers. Now that I have finished HP, I can read the other books that I have accumulated recently. 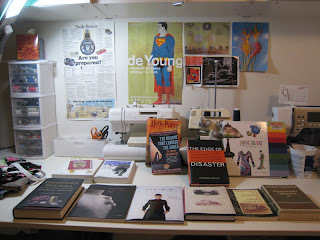 Click on the picture below for a bigger version of my sewing table. Notice that the disaster preparedness broadsheet on the and The Edge of Disaster on the right? Disaster preparedness is one of those things on my very long to do list. I heard the author, Stephen Flynn, interviewed on my local NPR affiliate. He states a very good case for why we should be more concerned and better prepared. When the interviewer asked if there was any reason for optimism, he replied, "Yes". He elaborated that there are many smart people, working in universities and national labs whose job is to think of the ways things can go wrong and recommend ways to fix or prevent them. He called the class of people "professional worriers". Right then, I had to buy the book. After all, he gave a name for my difficult to describe occupation. ;-) I am the woman who worries about everything, both at home and at work. At work, (amongst other things) I get paid to investigate technical problems and write reports about them. It is fascinating work. Notice Superman. I already blogged about my superhero fixation. There are also pictures of clocks (the woman who needs to be in three places at once), a Gees Bend quilt, and a Brett Weston photo of a calming scene. Anyway, I digress. What else am I going to read? The whole Peter Pan DVD project got me thinking about managing my Macs at both home and work better. 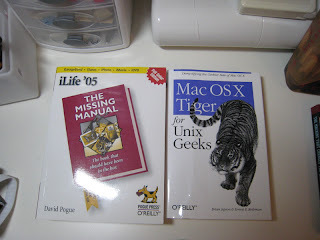 Since Berkeley Unix, the underpinnings of OS X, is like mother's milk to Cal grads, and I was too impatient for the Mac OS X Missing Manual which assumes no Unix familiarity, I decided to go for the Mac OS X for Unix Geeks series. The Japanese pattern books are delicious and deserve their own separate post later. I bought these from YesAsia.com after seeing them on Sew Mad's blog. Gina asked me if I read in phases. I have also been thinking about how I select reading ever since I read the article about the loss of diversity in book sales. My reading list is highly serendipitous and idiosyncratic. For instance, I picked up How Proust Can Change Your Life at a used bookstore because it looked interesting. I opened it up and his prose captured my imagination immediately. I was well rewarded for my time spent reading the book. 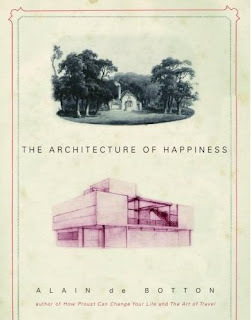 When the author, Alain de Botton, came out with a new book, the Architecture of Happiness, I bought that immediately. I read it at the Lair and blogged about it previously. 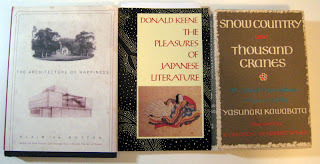 de Bottom said that he was depressed by the state of Japanese architecture until a friend suggested that he read The Pleasures of Japanese Literature by Donald Keene. I swiftly bought a used copy of it from an Amazon affiliate. I couldn't wait for the book to arrive. 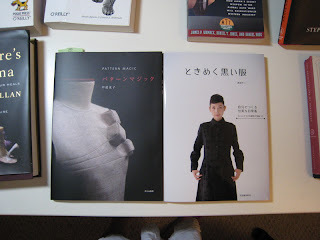 I was thinking about Japanese novels that I had enjoyed in the past. Since Mark and I had recently seen the movie, Snow Country (the old black and white version in Japanese with subtitles, not the one coming out next year), I decided to revisit Thousand Cranes by Yasunari Kawabata. Remember my travails knitting Latoya described in Imperfect Knitting? Obsessing over tiny flaws reminded me of characters in the book. But, when I read the book, I realized that I had misinterpreted the book 20 years ago, when I first read it. I am a different person now with more life experiences and I am allowed to change my mind. There is the obvious, that the cup I remembered in the story was not Raku, but a much older Shino piece. More importantly, I had missed the lesson of how objects and rituals are more durable than human life. The characters in the novel are all connected by their adherence to the rhythms and practices of the tea ceremony, even in the deprivation of the war and the post-war period. The tea bowls and other implements pass from owner to owner over the centuries (like wizard wands in Harry Potter). They endure when the owners do not. So who owns who? Thousand Cranes reminded me of Contemporary Japanese Bamboo Art by Robert Coffland. Many of the baskets in that book are used in tea ceremonies. In fact, one reason that the art has not died out is that people are willing to pay large sums for such an enduring ceremonial object. The book also said that many of the apprentices entering the field are women who turn to art because their husbands support them, and because job discrimination in Japan against women makes art an attractive occupation. I compare the optimism in basketry with the recurrent pessimism in Yoshiko Iwamoto Wada's Shibori. Time and time again, shibori samples are pictured along with prose stating that the technique is not known because the artist died without an apprentice. Or worse, the technique is about to die out because the artist cannot find an apprentice. Why are textiles not more highly valued? We went to UCLA's Fowler Museum of Cultural History yesterday. They are showing El Anatsui's first solo show on the west coast. El Anatsui is a genius; he uses castoff things to make a statement about castoff lives. 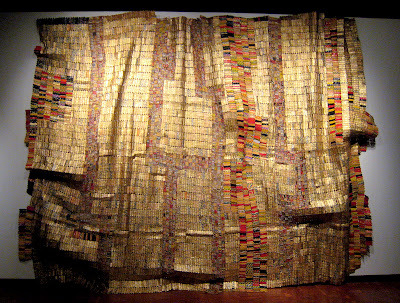 The "kente cloths" are actually made of caps and foil wrappers from liquor bottles. The detritus of wasted lives is used to create replicas of the traditional cloth worn proudly by royalty. The "wastebasket" is made up of printing plates from obituaries for a populace laid waste by AIDS. The artworks themselves are so gorgeous, yet the message behind them is so grim. Iris and I have been big fans ever since we were mesmerized by another one of his large "Kente cloth" pieces on the second floor of the de Young Museum in San Francisco. We first saw the piece when we went to see The Quilts of Gees Bend, another exhibition of art made from castoffs. I posted a Flickr slideshow of the exhibition. The Fowler Museum also posted a PhotoTour. Go see this show, if you possibly can. "An optically and emotionally stunning show." "A total delight and not to be missed." "It's hard to think of many found-object artists who have achieved work as intricately made, culturally resonant and visually sumptuous as El Anatsui's." "An opportunity that shouldn't be missed." We went yesterday to avoid the crowds today. They are having their monthly kids' art activity from 1-4 pm today followed by a free concert at 4 pm. Admission is free. Parking is $8 at the nearby garage by the Anderson School on the north end of the UCLA campus. The 20-year-old believed that interviews should be a two-way conversation for setting mutual expectations to make sure they are a good fit. The older person called job applicants a box of cereal. Who is more out of touch with reality? Can treating people as commodities be good business? I read these two paragraphs to the 20-year-old summer intern sitting in my office. He pointed out that Billy Warden is in marketing, the business of pushing commodities. His world view is significantly different than mine. I guess there is a reason I went into science in the nonprofit world instead of marketing. A couple of fellow pentagon knitters posted arresting images. Monica over at Bridget's Brei Blog posted a picture of a pat of butter. I have often admired the ripples that forms in butter when you pull a knife edge along the top, when the butter is at just the right temperature. But, in this hurry up world, I never stopped to take a picture of the "butterwing" like Monica. Beauty is all around us, I tell ya. 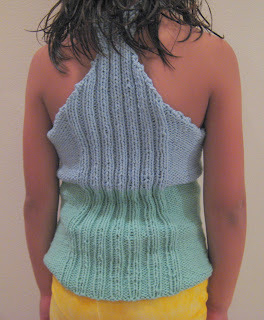 Cristiana of Knitaly posted some breathtaking photos of her Swirled Pentagon Pullover. I especially like Flower Power and Mi sento un po' pitagorica. (If the photo in the latter post does not show up initially, click on the empty photo box which links to the full-size image.) Cristiana stopped to admire her knitting and realized that she had a five-pointed star! I felt like I let Iris down during vacation week last week. We didn't make it out of the house much due to my illness. Oddly, she didn't miss the elevating and educational outings that I had fantasized about. Instead, she made up fantasy games for herself at home. She had a great time, playing at home. 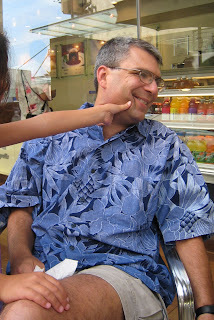 This week, Mark was away on travel and Iris' nanny, M, came over each evening to help. I came home from work yesterday evening, dead tired and very hungry. I watched the two of them engage in very energetic imaginary games of Iris' devising. At one point, they turned the ottoman into a boat and made paddles out of Tinker Toys. Iris sat on the right side, M on the left. Iris spotted a waterfall and yelled, "Go to the left!". M started to paddle double time. Iris said, "No. No. When we turn to the left, you need to stop paddling and I need to paddle more." M replied, as startled as I was by the realism in Iris' play, "That's right, I should know that; I am even a kayaker." 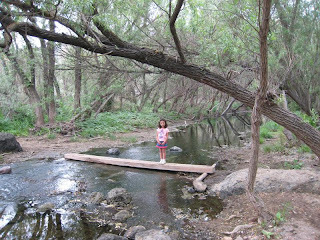 Later, when Iris said that they needed to turn right, Iris stopped paddling. Now I get to the real point of the post. Then I read the CS Monitor piece about the importance of child's play. Unstructured, self-initiated play has become a rarity in the lives of many American kids. Mark and I feel strongly that we want Iris to have as much "goof-off" time in her childhood as we had. Well, Iris got plenty last week and now I don't have to apologize when I explain what we did or didn't do last week. I can just tell people to read the article! I am a little bit embarrassed that the kids at the Waldorf school in the article pretended to throw a dinner party at a private home. My kid and her playmates play restaurant. I really have to cook more for friends. We used to do that almost every weekend as grad students and postdocs. What happened? How did restaurants become our dining room? Here are the promised pictures of the 2/3 scale Latoya Tank. You can fine-tune the width with the number of side panel stitches. I used the same row count for the cabling as for the full-size sweater. The cables are elongated relative to the adult version, but in a good sort of way. I thought the cables looked too scrunched together on my sweater. I ran out of pistachio green Cotton Ease. None of my other hoarded odd balls of (discontinued) Cotton Ease looked right. The yarn stores didn't offer anything suitable. I remembered a cone of pale blue cotton yarn, the same type that I used for Plum Blossom. Iris approved of the color so I knitted on! I solved the slipping strap problem by turning it into a racer back. The selvage edges don't look so great. Let's hope that, after washing and drying, they will improve. If not, Iris moves so fast, no one will be able to observe them closely. Where's the other half skein of Pistachio Green Cotton Ease? Luni changed Latoya from a tank to a cap-sleeved sweater. How else do you corral those exercise balls? What other use do we have for a huge jacuzzi bathtub in the middle of an extreme drought? The NY Times ran an article about Stephen Szczepanek, a dealer of Japanese folk textiles. It is easy to miss because it was in the Real Estate section. There are beautiful photographs of his home/gallery and collection in When the Everyday Becomes Art. The above photograph was taken by me from the Riverside Museums post. He much more eloquently explains what I was trying to say in that post about creating beauty in the face of extreme poverty and hardship. Well, it wasn't much of a vacation if my goal was sightseeing around LA. I was feeling poorly the whole time; we can't be sure if I was suffering from pollen allergies or had some sort of infection. It didn't matter because I am supposed to rest whenever that happens. Iris was happy to spend a week at home without any plans. She read, played inside the house and around the yard, surfed the internet and watched a little bit of TV. Of course, there was Lego action. See those three vases of white flowers in the background? They all came from one monster Nantes carrot that I let go to seed. 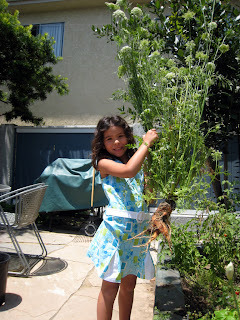 One kid, over here for a playdate, told me that the carrot would not taste right if we let it flower. I told him it was OK because I always let one or two plants go to seed so I can collect the seeds for the next crop. That is one funky carrot! It looks a bit like orange ginseng. Iris also made some very imaginative art projects with materials found around the house. I was very impressed with what she can do with toothpicks. The piece in the dining room reminds me of a work in the national gallery with pieces of rope, tacked up to the wall in a gentle wave. We never got around to the mommy and me dresses. I took her to Joann's for dress patterns and it became clear that we had different ideas about how we wanted to look. I guess that is to be expected because we do have different figure types. She also had no interest in the swatches. Instead, she reminded me that we already have a fabric store in our house. 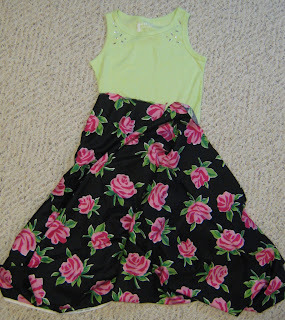 I did do a little bit of sewing and wardrobe refashioning. 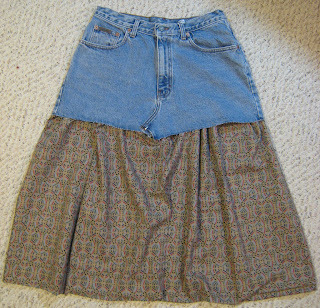 First, I hemmed up a couple pairs of pants that had been languishing in the mending pile for two years. 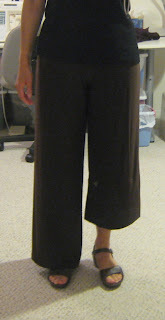 Palazzo pants are not my thing so I turned this pair into gauchos. The back to school sales began this week. An organized mother would have gone through her children's wardrobe and figured out what was needed in advance. In a parallel universe, I might have done that. Instead, I went to a two day painting class and then rushed her to the stores on Friday to buy shoes. I didn't buy her any clothes because she was eager to get out of Nordstrom and explore the rest of the mall. Only after returning home with the haul did I look through her wardrobe. I hauled some stuff to Goodwill and returned with a few items. I also discovered, on the shelf in her closet, some clothes from Goodwill that I had bought and set aside for when she grew into them. 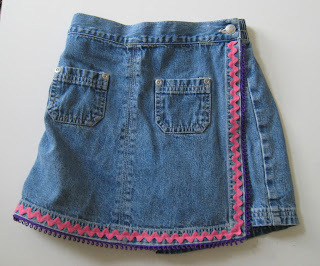 Iris loved her denim skirt trimmed with pink fun fur so much. She squeezed herself into them even though they are two sizes too small. (She is willing to suffer for fashion.) We retired that skirt, putting it in the bag bound for her cousin. Next up, we want to make a skirt from this cotton sateen (left over from a dress I made 10 years ago) and attach it to the Iris' tank top at the waist to make a swingy dress. It looks like there is enough to make four flared skirt panels. Iris dove into the stash closet and pulled this out immediately. What great taste. 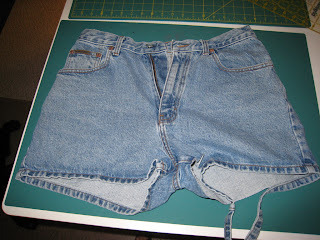 I found this pair of denim shorts at Goodwill. I cut off the bottom hem. Then I undid the crotch seam and auditioned some fabrics for the skirt bottom. The next candidate for the skirt is a geometric pattern. Iris says that she will not let her mommy go out in this. I asked what she had against the fabric. 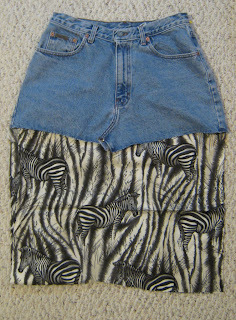 She said that it was not the fabric, it was the weirdness of the cutoff jeans thing. She does not like the deconstructed look. I did want to show off that, in healthier days, I sewed quite a great deal. Mark pulled out this shirt for our outing to the Pantages theater to see Ratatouille. There is a trick to getting the pattern to match at the center front and pockets. I learned that by watching a cutter/pattern maker work. Of course, as a college student and wardrobe mistress/dresser, I was not allowed to cut fabric or to even sew anything that showed on stage. I was allowed to watch and hand him implements as if he were a surgeon. I have to admit to being such a bad mom, that I sometimes use the TV and internet as a babysitter. One morning, when I really, really wanted to finish reading my book, I let Iris use my laptop to surf the web. (I set up the iBook with her own profile and put a few approved websites on her bookmark bar.) She decided to see what's new at Barbie.com as it has been a while since she last visited. In general, I am not keen on Barbie anything. But she can only play the PBSkids games so long and I discovered that the YouTube cute animal videos are not necessarily kidsafe. (But that is a whole 'nother story and we won't go into that now.) She decorates and redecorates the virtual bedroom in Barbie world and doesn't bother me about redecorating her real room. I can go along with that. She asked me to come read something on screen so she could continue. That's odd, I don't recall that ever happening before. What does it say onscreen? She read something about how she has to be thirteen or else have a parent sign her in. Since when did kids have to sign in to Barbie.com? It is a visually rich (or cluttered) entry page. Notice midway on the right, there is a link for Parents in a font that I can easily read. It doesn't mention the virtual world at all. How did Iris get to the password-protected part of the site? Look up at the very top to the moving banner bar. In font about half the height of the Parents link, you will see links to Barbie, My Scene and Polly Pockets. What's this new link, Pixel Chix? I visited the site and looked at the FAQs for PixelChix.com. Q: What is the goal of play in the Pixel Chix™ Love to Shop™ Mall? A: The main goal of play in the Pixel Chix™ Love to Shop™ Mall is to work and earn money, and then use the money to buy fun things. Each Pixel Chix™ pal can work and shop in any of the 4 available stores. Every time you buy a new item, you unlock new animations/games that will play when you select that item in the money/stuff screen. There are also games that you can play with your Pixel Chix™ Love to Shop™ Mall pal just for fun while she is shopping. These games can be played by pushing the smiley-face button (fun button) while shopping in any store. It goes on in horrifying detail. * What is the goal of play in the Pixel Chix™ Love to Shop™ Mall? * Are there levels of play in the Pixel Chix™ Love to Shop™ Mall? * How does my Pixel Chix™ Love to Shop™ Mall pal earn money while working? * How does my Pixel Chix™ Love to Shop™ Mall pal go shopping? * What happens if my Pixel Chix™ Love to Shop™ Mall pal does not have enough money to buy something? * How does my Pixel Chix™ Love to Shop™ Mall pal access things she has purchased? * How does my Pixel Chix™ Love to Shop™ Mall pal play games? * How do I make one Pixel Chix™ Love to Shop™ Mall pal go from her Pixel Chix™ Love to Shop™ Mall to an adjoining Pixel Chix™ Love to Shop™ Mall? * How do I make the Pixel Chix™ Love to Shop™ Mall pal leave the Pixel Chix™ Love to Shop™ Mall and return to the Pixel Chix™ House? * Can I connect my Pixel Chix™ Love to Shop™ Mall to a Pixel Chix™ Car and have them visit? * Why aren't both pals shown in the Pixel Chix™ Love to Shop™ Mall when I call a pal into a Mall from another Mall or Pixel Chix™ House? My drug regimen is nauseating enough, but I just about tossed my cookies when I read this. NO! NO! NO! I do not give my permission. You do not teach my daughter that the point of life is to fritter away her life force to earn money to buy frivolous stuff that she doesn't even need. The point of life is not to be a "good little consumer". Advertisers has a different goal for our lives than we do. But I didn't discuss that with Iris. I wasn't ready for that discussion. Instead, we had a little discussion about websites that put cookies on your computer and which ones we should avoid. I didn't go into the ubiquity of cookies because I don't know how to explain the nuances of when cookies are acceptable and when they are not. My mother did not explain any of this to me she didn't need to. Advertising did not reach as deeply into our lives 30 years ago. Also, we didn't have this technology in the home yet. Notice I said in the home. This technology is older than commonly believed. It just wasn't in use outside of a few research labs. Markup languages that preceeded html had been invented decades before Barbie.com. I grew up on the fringes of what is now known as Silicon Valley and my father worked at a national lab. As a tween, I had a programmable calculator and my sister and I shared a home computer. On Family Days at the lab, I recall using a networked computer to play a game where I had to try to guess if there was a human or a computer program on the other end. I was caught unprepared for the birds and the bees discussion as well. The introduction for Barbie Girls is even more disturbing. The girls earn "Viva" a form of currency, by playing games or watching movies at the "cinema". I interpret that to mean watching commercials and helping them gather marketing data on girls' preferences. I still haven't figured out how Iris got to Barbie Girls the other morning. She might have heard about it through viral marketing and typed in the url on her own. She learned about Webkinz and Club Penguin from other girls. Mickey Lawler made painting blue skies look like a piece of cake. Back at my own work table, the first one, at top, was a disappointment. I tried again with less water. It was still too runny. After it dried slightly, I went back with an almost dry sea sponge dipped in a stronger paint+water solution. Experimentation is good. Mickey estimates she has painted 40,000+ yards of fabric in her lifetime. I have painted about 5 yards. The first sunset proves that one should always use test fabric before applying paint to fabric. The second sunset, at bottom, is much improved. We tried painting water. The bottom piece was scrunched to give support to the top piece. The top piece was laid on top, painted and sprinkled with salt. The two pieces look different, but both very usable for quilting. Color mixing comes with practice. I clearly need more practice. Anticipation. The sunprint is shown below. Yeah, I am having fun. * This was painting, not dyeing. However, I cross-tagged it dyeing so that it can be compared to dyed fabrics. Ron Charles wrote a don't miss article about the loss of biodiversity in reading habits, Harry Potter and the Death of Reading. So we're experiencing the literary equivalent of a loss of biodiversity. It doesn't necessarily have to be that way. Read the whole article and make up your own mind. Why did I make a point of mentioning Picasa and the Windows machine? Because this is a two operating system house and the iBook was busy rendering and burning all day long. In between doing everything I wrote about, I also learned how to use iPhoto, iMovie and iDVD to produce a DVD with the Peter Pan show and a slideshow of related stills. I also added music, menus and scrolling stills to the menus. Then I burned the whole thing to a DVD. If anyone knows a better way to do this, please leave a comment. I downloaded and ran MacJanitor. (If you turn your Mac off or put it to sleep between 3 and 5 AM, as any energy-conscious person would do, then your computer is not running OS X's system housekeeping chron jobs.) Running MacJanitor, which invokes the OS X housekeeping scripts, and emptying the Trash in several applications saved me a couple of gigabytes. If only I did that before the backup! Anyhow, this has taken me the better part of Sunday and Monday. I have burned 2 DVDs and have 2 more to go. I do love running iLife and Unix on the same machine. I was never super comfortable with the Windows environment and the way it hid "dll" files promiscuously in secret places. Partisans would say that Apple has the upper hand there. But, ask them to show you the location of the real /etc/passwd file. If you know the answer, please leave a comment because my local OS X guru and I desperately want to know. More musings about Technology and my conversion to a Mac. I realized yesterday, as I madly dashed about, running errands and going to the doctor, that I am not on vacation. I have really signed up for a week of stay at home motherhood. I had better keep my "market work" because that job is less physically strenuous than SAHM. It pays better, too. I had even prepared for my "vacation" by doing 6 loads of laundry, precooking meals and getting the garden in a reasonable condition on Friday and Saturday. Additionally, the cleaning lady had left this house in ship-shape last Thursday. In the morning, Iris and I decided to tackle her neglected photo album. 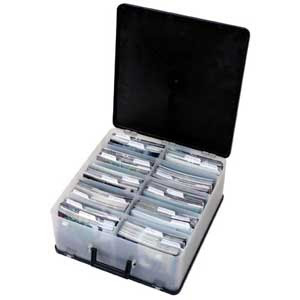 My mother in law had repeatedly asked the whereabouts of Iris' photo album. She pointedly told me that she had made albums for all three of her children. It is not that I don't want to do it. I love shopping for scrapbooking supplies. I love collage. (Everything I made in my high school and college art classes turned into a collage.) I blame lack of time and more pressing priorities. Previously, Iris had already scrapbooked her daycare years. Next, she wanted to commemorate her two years in Montessori school. We looked through the photographs and Iris asked why they were all baby pictures. I told her that her Montessori years were all digital. All this digital picture tuning and uploading took some time and Iris lost interest. She retreated to her bedroom with the riveting book, "Little House on the Prairie". As long as we were out, we ran other errands. I needed some supplies for the Mickey Lawler Fabric Landscape Painting class and the on-going 5S (Seiri and Seiton again) project. After Costco, we visited Staples and Home Depot. Iris had also outgrown the dress patterns and we needed to stop by Joann's to get larger ones. Yipes! Do not let a girl with no concept of sewing and scheduling difficulties near the pattern books. Then, since we were already at Joann's, the pollen was flying and my immunologist was on the way home, we stopped for allergy shots. It was 4 PM by the time we got home. We both ate a snack and I realized she was due for Tae Kwon Do at 5 PM. She didn't want to go. I made her go. A whole lotta details were omitted here. Class began and ended late. I used that time to show off the movie project (more on that later) and to compose a to do list for "family work". Yipes! It was 6:30 PM before we got home. Mark had just finished cooking salmon, rice and asparagus for dinner. My hero. We did not resume the scrapbooking until after dinner and bathing. We worked from 8:30 to 11:15 PM. Mark conked out and Iris was at the end of her tether. But, I just wanted that sucker to be done. 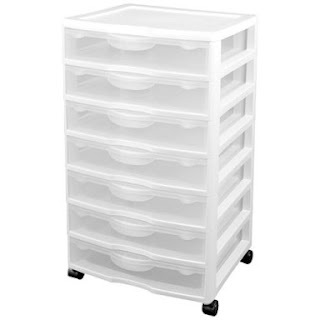 I found these two organizational products, bought at Target and Costco respectively, very useful. I put Iris in front of the TV today so I could do a little writing and computer work. We may not get to the Getty Brentwood center until Friday. Mr B threw in two copies of the first 10 lesson booklets. Iris had done 8 of them during the spring session, but she only got through the basic portion of each lesson. We wanted her to be able to do the challenge parts as well. The fall session starts October 1, 2007. 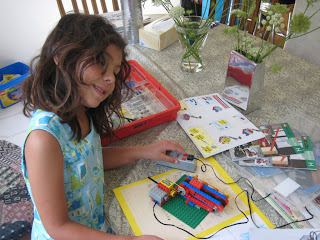 Although their students are mostly boys, they have another six year old girl student that really "gets" Lego. The two Mr B's (both partners have last names starting with B) want to form a semi-private class for the two girls. Kids these days have such busy schedules. I hope we can swing it. I used Gmaps Pedometer to discover that we live ~500 meters from Mr B's Bricks. Next, we will visit The Cotton shop, ~500 meters in the other direction, for mommy and me dress fabric. Iris prefers the one second from the left. We will use the car to drive to Getty Center to see the Überorgan that Sitting Knitting blogged about, perhaps on Monday or Tuesday. Wednesday and Thursday, I am taking a class from Mickey Lawler to learn how to paint Landscape Fabrics. Mark wants to take Iris to the Museum of Natural History one of those two days. We also want to hang out at the beach one day. One week vacation at home is too short. This being LA and all, Iris attended a summer performing arts workshop (PAW). The kids rotate in groups between instructors for movement, voice and acting. At the end of each session, they put on a show for friends and family. The show consists of skits that the kids wrote, songs and dances that they learned, and a short play. 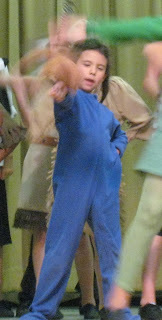 In the first session, the kids performed (an abridged version of) Peter Pan. Iris landed the role of Michael, Wendy's youngest brother. She seemed very into it so I asked her if she wanted to be an actor. She replied, "No. What do you call the person who tells everyone what to do?" "Yes, I want to be the director." She had taken weekly dance lesson at her schools off and on for the last three years. She did not like the most rigorous teacher, the one that had been a contract player for one of the major movie studios between the time she graduated with an MFA from NYU in dance and when she became a mother. I didn't understand why she didn't like that dance teacher. She appeared to be an excellent teacher. Iris explained, "She makes me do her dance, not my dance." The teacher said that all dances were choreographed by herself except for one dance. She repeated Iris' name twice and said that she was only six and a half. Well, it is not directing, but she got her first choreographer's credit. Maybe we should take up her Tae Kwon Do instructor's offer to introduce Iris to his agent? I know you are wondering, how did the kids fly on stage? They flew on clouds, of course. A less imaginative person would say that they are sitting on bar stools sheathed in white canvas. But I saw my kid fly, really. Notice the teddy bear attached to her wrist with elastic? 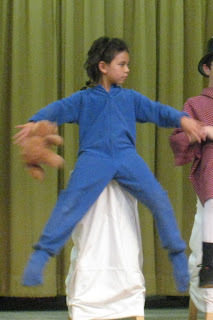 It was such a hoot to watch teddy fly around on stage as she danced. As a general rule, I don't post pictures of other people's kids on the internet without their permission. 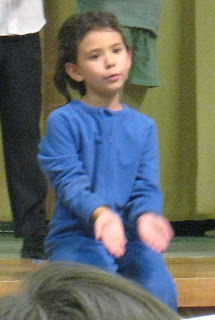 Therefore, I can only show you tightly-cropped, grainy photos of Iris and teddy. Friends and family can email me to arrange delivery of a DVD with my photos and Mark's video of the production. Considering all the costumes and props that the other parents had to come up with, I got off easy. All we needed to provide was a teddy bear, a pillow, a blanket, and a footed blanket sleeper. How do you find a footed blanket sleeper in LA in July? Piece of cake. I found it at Lands' End. While I was loading up the virtual shopping cart, I bought her a rolling backpack, a pair of adorable flowered Mary Janes and a cabled cotton cardigan as well. All I needed to do was hem the sleeves and sew up the excess loose fabric at her toes. The only way my job could have been any easier is if I was Mark. Lately, I have read several potshots claiming that bloggers have somehow led to the decline of reading in the general public. I wasn't even going to dignify that with a response. I realize that professional writers (and musicians) are having a difficult time adjusting to the rapid changes in the dissemination of their intellectual property. But I would like to point out that scientists have been having a very hard time of late as well. Why else would a Bill of Rights for Scientists and Engineers even be proposed? Anyhow, let's call a truce. I read a couple of good great books recently that I want to recommend. I always enjoy reading the work of Witold Rybczynski and The Most Beautiful House in the World is no exception. (I read this at the Lair last month; see the aside below.) WR tells the story of how he came to build a house for himself. Of course, he digresses endlessly into history, engineering and philosophy and these digressions make the story so much richer. The book does not lend itself easily to description and you must read it in its entirety for yourself. WR made one point that resonated with me as I struggle with the decision of whether to remodel our home to make it more functional for us. Near the end, he told the story of Ramón Castrejón, a Mexican man who built a home for himself and his family using whatever materials he could scrounge. Building your own home-and inhabiting a space of your own making-is considered by most be be a luxury. That is why the places that people have fashioned for themselves are more touching than those-no matter how splendid-that others have made for them. Both architecture books have taught me to see and to interpret what I see. They have also given me a vocabulary for describing and understanding how I relate to buildings. 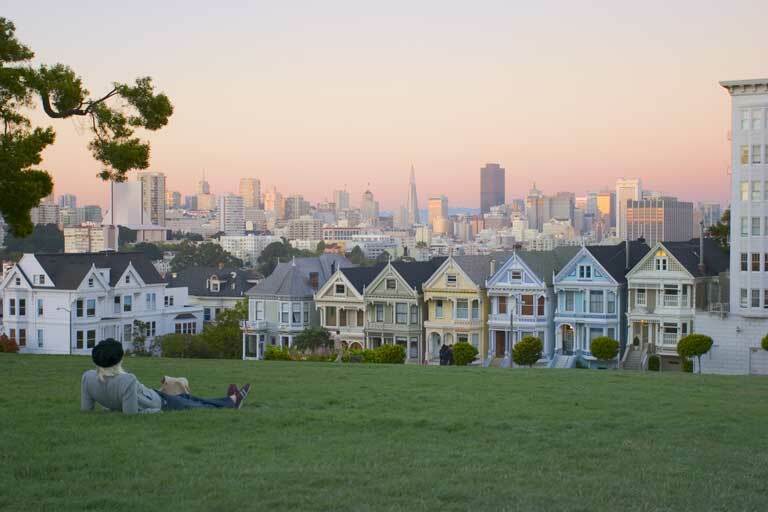 What makes the "Painted Ladies" of San Francisco so universally admired? It is the diversity of color and design within a uniform framework. There is enough variation to give the eyes something to look at, yet does not confuse the brain with a dizzying array of contrasts. There is plenty of Frank Lloyd Wright's "eye-candy", yet there is also a coherent whole. OK, now what is that at the top of this post? It is certainly not San Francisco. 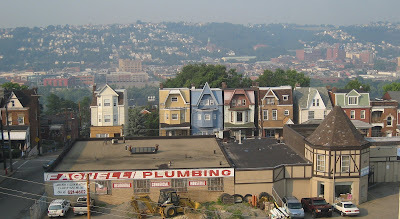 It is a row of houses as seen from the Hampton Inn in Pittsburgh. I flew for over 9 hours to attend a 2 hour meeting at Carnegie Mellon University. I asked if I could telecon it in, but was told that I needed to be there in person. Go figure. On the outbound flight, I took a picture of my home town. The haze is mostly the marine layer. 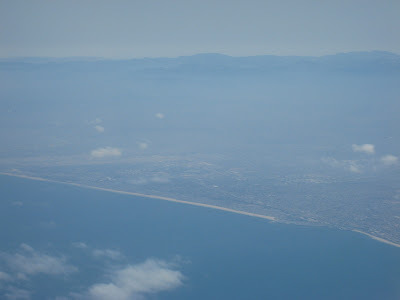 As we flew further inland, I noticed the haze had a distinctly brown cast. At first, I thought it was localized Los Angeles smog. 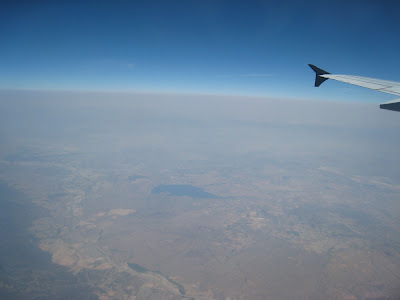 But the brownness did not lessen as we flew further and further east. It appeared that the smoke was a widespread phenomenon due to the large number of wildfires in the western United States this week. 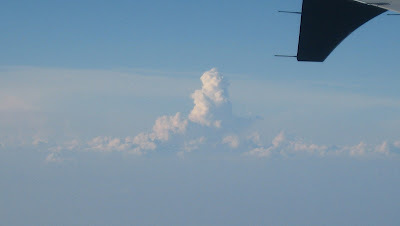 As we approached Pittsburgh, I began seeing clouds like this. You don't see this very often in Los Angeles! One of my favorite times of the day at the Lair is before breakfast. Mark and I get up as soon as we can brace ourselves for the cold. We walk to the head (separate communal bathrooms for men and women) and then rejoin for coffee on the sunny deck of the main lodge. When the first breakfast bell rings, we head back to our tent to wake Iris up. One morning, I sat with a couple that I had seen several times but never spoken with at length. I put my book down and they instantly lit up. They had both read the same book. In fact, one of them, a practicing architect, had read everything Rybczynski has ever written. 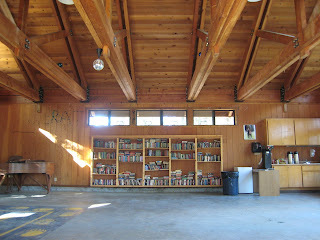 One of the features of the lodge is the "take one, leave one" bookshelves. I forgot to take a picture of it. You will have to look at a picture of the bookshelves at the smaller Vista lodge and imagine 3 times as many books. Visitors choose hotels by location, price and amenities. Mark and Iris are not wild about the Hampton Inn SFO. (They prefer the Embassy Suites SFO North with the koi pond in the atrium and the huge swimming pool.) However, I do prefer the Hampton Inn next door because of one amenity which you can glimpse in the tiny photograph on the hotel's home page. Here is a larger picture of the lobby fireplace. You can take a book and bring it back during your next stay. If you don't bring it back, no big deal. A service restocks the shelves regularly to keep them full. You can't see the titles from this photograph, but you will have to trust me that the service and the other guests have great taste in used books. 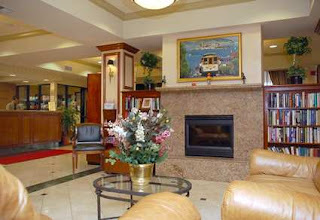 Like many airport hotels outside the city, it is very reasonably priced on weekends. The location can't be beat. It is 5 minutes from my mother's house and 15 minutes from downtown San Francisco with good traffic. Iris agrees with me that the staff at this hotel are nicer than the ones at most hotels. They are phenomenally nice and service-oriented. Now, if you excuse me, this blogger will go and read another actual book now. I will write more about that book and why my home needs some design tweaking later. I also finished Iris' Latoya sweater and will post about that soon. First, I need to write and file my trip report and findings. Remember my rant in Fire is a river that runs uphill? 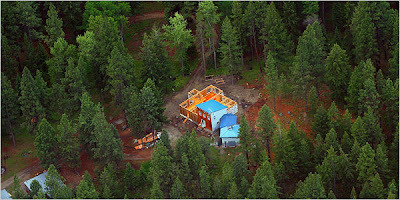 Don't miss the NY Times article, On Fringe of Forests, Homes and Fires Meet. A new generation of Americans (snip), in moving to places perched on the edge of vast, undeveloped government lands in the West, are living out a dangerous experiment, many of them ignorant of the risk. About 45 percent of the Forest Service’s proposed budget for 2008 is designated for firefighting, compared with 13 percent in 1991. Last year, the agency spent $2.5 billion, a record, thinning fuels and fighting fires that burned 9.9 million acres, also a record. California, braced for what fire officials have said could be one of the worst seasons in history this year, has set aside $850 million for wildfire suppression. The Department of Interior, which includes the National Park Service and the Bureau of Land Management, the country’s largest landlord, spent $424 million fighting fire last year. To put this in perspective, California budgeted $5.1 billion of the University of California and $4.0 billion for the California State Universities for this year. $.85 billion is not chump change. I would also argue that state spending on higher education has the potential to pay back the state many-fold because graduates (relative to those who never went to college) will likely earn more and hence, pay more in taxes. Aside: The article does end with a newly transplanted (to the woods) couple deciding to join the volunteer fire department. That's showing the right self-sufficient pioneer spirit! I knew a woman who moved from the city to the mountains. Not only did she join the volunteer fire department, but she eventually became the fire marshal. She was always complaining about the part-time residents in the fanciest and biggest homes. It appeared that those owners were much less likely to clear their brush or thin trees too close to their structures; they almost never joined the volunteer fire department. It drove her crazy. Up in the mountains, you depend not just on yourself, but on your neighbors to do their part for mutual safety. What could she do? She cited and fined them. They could afford to pay her fines and ignore her requests . Swatches courtesy of the Cotton Shop. 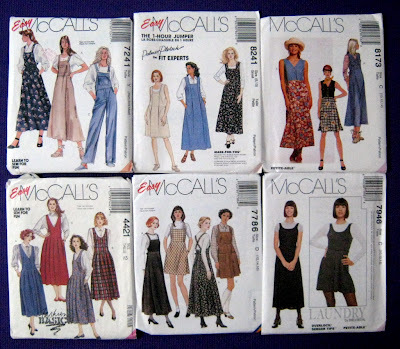 Which one should I sew up for mommy and me dresses on my vacation week coming up? I have seen this quiz on others' blogs. Depending on the day I take the quiz, I get slightly different breakdowns. Overall, I score between 60-70% right-brained. That is the problem with metrics. They are a snapshot, but far from the whole truth. The fact that I would even bother taking the test several times to gauge the variance attests to either my procrastination skills or my scientific training. I loved Joel Achenbach's WaPost piece yesterday, Three Cheers for Nervous Handwringing. I am excerpting the list of critical thinking skills, but go read the whole thing. 1. Ask questions; be willing to wonder. 2. Define your problem correctly.